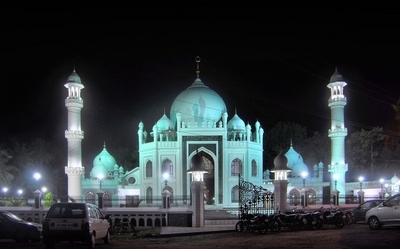 Illuminated mosque in Kerala – Photograph 2009 by Challiyan at ml.wikipedia, Via Wikimedia Commons. Kerala is a state on the southwest Indian coast in which Islam counts a quarter of the population 0f 33.3 million, according to the national census. It is characterized by good relations between Muslims and the local Hindu majority of 56 percent, plus a Christian minority of 19 percent. Islam in Kerala is influenced strongly by the spiritual heritage of Sufism. This has allowed the Muslims of the state to resist an offensive by the fundamentalist and radical Deobandi sect, which purports to represent authentic Sunni Islam. Deobandism inspires the Taliban in Pakistan and Afghanistan, and its adherents have recently come under a serious examination by global media. For example, the London Financial Times dedicated an article in its issue of October 30, 2015, by its Indian correspondent, Victor Mallet, to the chief medresa of Dar ul-Uloom at the north Indian location of Deoband. Mallet then noted that Deobandi religious education has come to be associated widely with radical ideology. In a second survey, appearing in the same paper on December 30, 2015, but signed by Farhan Bokhari in Karachi, the proliferation of Deobandi medresas throughout the Indian subcontinent was linked to Saudi-based Wahhabi influence. Further, Deobandis have a large presence in the British Muslim diaspora and elsewhere. Like the rest of the South Asian Muslim community, in its native territories and abroad, Kerala has experienced the activism of Tabligh-i-Jamaat (Call of the Community or TJ), a Deobandi preaching group that organizes mass assemblies and counseling camps. At first, the Deobandis are seen typically by ordinary Muslims as supporters of a purified Sunnism. Thanks to a serious effort, however, the established Sunni ulema (clerics) of Kerala have exposed and defeated TJ. The moderate Sunni leadership in Kerala opposes TJ as a hate-mongering threat to religious coexistence, promoting hostility between Muslims and their non-Muslim neighbors. TJ operates with contemporary methods of mobilization. During the month when Muslims from around the world go to Mecca for the hajj pilgrimage, TJ activists fill the hajj hostel maintained in the Kerala city of Kozhikode. TJ advertises charity operations that draw the approval of ordinary Muslims. Unfortunately, most Muslims were long uninformed of the criticism of TJ advanced by the conventional Islamic scholars in Kerala. TJ presented itself as an effort for modernization of Islam, opposed to the principles of Sufi Islam. To these radical reformers, the global Muslim community suffered an intellectual decline and the loss of its historic glories. The initiatives of TJ and others, including the Saudi-Wahhabis, aim ostensibly to restore a brilliant Muslim past. Many of the reformers then attack Sufism and assail those who disagree with them as unbelievers. Like other such groups, they seek to discredit the great Muslim philosophers and proclaim that the overwhelming majority of the world's Muslims have gone astray. At the same time they endeavor to present their Islam as nothing more than devotion to prayer and recitation of blessings. TJ emerged in northern India in the 1940s, led by one Muhammad Ilyasi. Seeing that it opposed the Sufism long implanted in their community, the Sunni scholars of Kerala, headed by the Samastha Kerala Jamiyyathul Ulama (Samastha, the All Kerala Community of Muslim Scholars), decided to monitor and analyze TJ and its works. Kerala Muslim clerics were impelled to this attitude regarding TJ by their own legacy, based on the transmission of Islamic metaphysics through the Ba'Alawi Sufi order, brought across the Indian Ocean from Hadramaut in south Arabia. The Hadrami Sufi saints held to a pluralistic outlook adaptable to Kerala, a multireligious society with a secular nature. After their detailed study of TJ, the traditional Sunni scholars decided and declared it to be a heretical group rather than a spiritual movement, and called on the Sunni believers to remove and distance themselves from it. The Samastha clerics invited the TJ leaders to meet them in person and feel free to present their views, to avoid a one-sided position. The scholars were committed to dialogue. But the Kerala leadership of TJ claimed they could not accept such an encounter without the approval of their North Indian leaders, and no such meeting ever took place. Nevertheless, many debates and public discussions involving TJ and the Sunni scholars were held in Kerala through the 1970s and 1980s. The main agenda of the clerics was, at first, to defend Sufi Islam. TJ never condemned publicly the pilgrimages and visits to Sufi shrines in Kerala. But extreme disapproval of such Sunni practices, and a campaign for demolition of Sufi tombs, are common in other TJ-dominated regions, especially and more obviously in northern India. The Kerala traditional scholars concluded that TJ had to soften its brutal methods locally because of their weakness in Kerala. TJ persisted in discouraging Sufi festivals and mawlid observations of Muhammad's birthday. Traditional Kerala Muslims clerics view TJ as a form of "intellectual violence," and a factor for disintegration and disunity among the local followers of Islam. Where the attention of the scholars lags, the possibility for the spread of Deobandism and similar groups is higher. To block their propagation, it is necessary for the different groups of Sunni followers to cooperate. Moderate Islam must keep its vigilance intact to defeat extremism and polarization. Muhammad Ashraf Thachara Padikkal lives in Kozhikode, Kerala, India. He is an interviewer, writer and independent research fellow, specializing in the areas of Sufism, Islamic studies and cultural anthropology. He is also interested in tradition and philology.